Junior lightweight Michael Dutchover (12-0, 9 KOs) closed out Thompson Boxing’s season finale in emphatic fashion by knocking out the well-tested veteran Ruben Tamayo (27-12-4, 18 KOs) in the third round Friday night from the Doubletree Hotel in Ontario, Calif.
Dutchover, who had turned 21 the day prior, celebrated his birthday weekend with his fifth win of the year and fourth straight knockout victory. The West Texas-based Dutchover used his patience in the first round to learn the appropriate angles against Tamayo, who had previously been in the ring against first class talent such as Jhonatan Romero, Oscar Valdez, Joseph Diaz and Jesus Cuellar. In the third, Dutchover unlocked his power with a left hook to the body that stunned and forced Tamayo to take a knee. After Tamayo beat the count, Dutchover attacked and landed a right onto the midsection, which dropped Tamayo once again. Referee Lou Moret immediately waived off the fight at the 2:15 mark. In the “Locked n’ Loaded” co-feature, lightweight Pedro Moreno (11-0, 7 KOs) required only two rounds to dispatch Erik Aguirre (6-10-1, 4 KOs). Moreno, appearing in his fourth fight of the year, looked the part of an elite prospect by taking command of the fight from the outset. He peppered Aguirre with combination and after combination until referee Zachary Young called the contest at the 1:13 mark. In other action, junior middleweight prospect Richard Brewart (3-0, 1 KO) outpointed the very busy Antonio Luis Hernandez (1-6) through four rounds. Brewart showed a good mix of boxing skills with his counter punching ability. He stopped Hernandez’s forward attack with solid defensive instincts and managed to score points in the process. 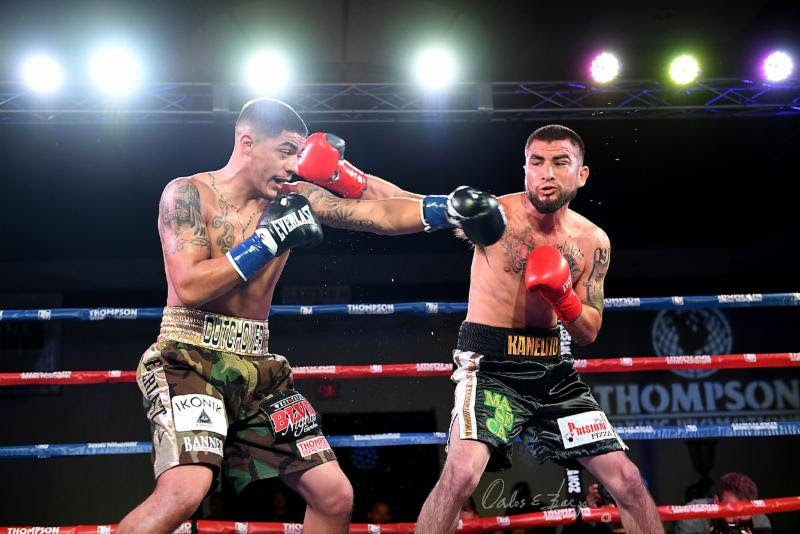 Another junior middleweight prospect Leo Ruiz (3-0, 1 KO) showed signs of promise by sweeping the scorecards on veteran Nam Pham (3-8-1) in their four round fight. Ruiz appeared more experienced than his record indicated, displaying a sound foundation on his way to his third professional win. Scores: 40-36 all around. Bantamweight Mario Hernandez (8-0-1, 3 KOs) remained unbeaten with a one-sided unanimous decision win over Luis Montellano (0-4-2). Hernandez, who suffered a draw in his last fight from September, rebounded nicely with a strong performance. Hernandez got inside the taller Montellano with body shots, which worked as the winning formula on Friday night. Featherweight prospect Arnold Dinong (3-0, 1 KO) defeated Alex Solorio (4-5, 1 KO) by unanimous decision in the “Locked n’ Loaded” show opener. In his brief career, Dinong has shown a fan friendly style of volume punching with effective defense. The 24-year-old turned professional earlier this year. Scores: 40-36 all around. “Locked n’ Loaded” was presented by Thompson Boxing Promotions and sponsored by Everlast.